Usecase scenario : A customer wants to partition their one EBS volume into multiple logical partition hence we will create ROOT SWAP and LVM partition on EBS volume. 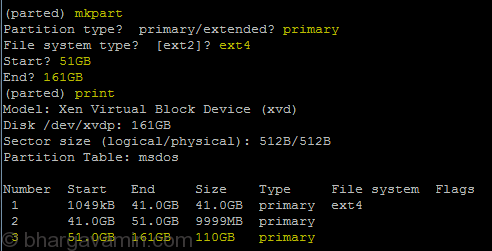 Lets say they have 150 GB EBS volume which they want to logically divide into 3 partitions of 40GB Root/OS, 10GB Swap(decided as per instance type), 100 GB for /data. Now normally we would go ahead and create partitions using parted or any other tool but in AWS specifically you cannot partition a root volume when it in use so for this you will have to stop the instance and detach the volume, attach same volume to a already running instance as a secondary partition. Dont’t mount it as you cannot work on mounted volume. Once you’ve done that your good to perform partitioning on EBS volume. This will display the size and the volume you’ve have recently attached, make sure you know the partition name properly before performing any task. Step 7 : Once all the partitions are done, now your good to attach volume back to the original instance. To move back EBS volume back to original instance. Once you’ve have attach volume back to original instance follow below mentioned steps to perform LVM, SWAP on EBS volume. That’s it you successfully create ROOT SWAP and LVM partition on EBS volume on AWS.